3-1/2" aluminum screw posts are designed for binding ledgers, computer printouts, and other very thick books. Of course you can use our screw posts to connect just about anything that you can punch or drill a 1/4" diameter hole through. They can also be extended to almost any length with our screw post extensions. If your book is going to be subjected to a lot of use, or if you are going to be binding materials that are heavier than usual, we suggest using our steel screw posts. These posts and screws are much stronger than our industry standard aluminum screw posts. They are also larger in diameter than the aluminum screw posts, so please check the dimensions of the posts that you want to use when you are designing your book. The post length is 3-1/2" and the diameter is 3/16". The post length is the maximum binding thickness (inside length.) We recommend that you measure the total thickness of the materials that you are binding to obtain the best fit. We also recommend that you punch or drill a 1/4" hole in your documents to accept these posts. Posts are 3/16" diameter. 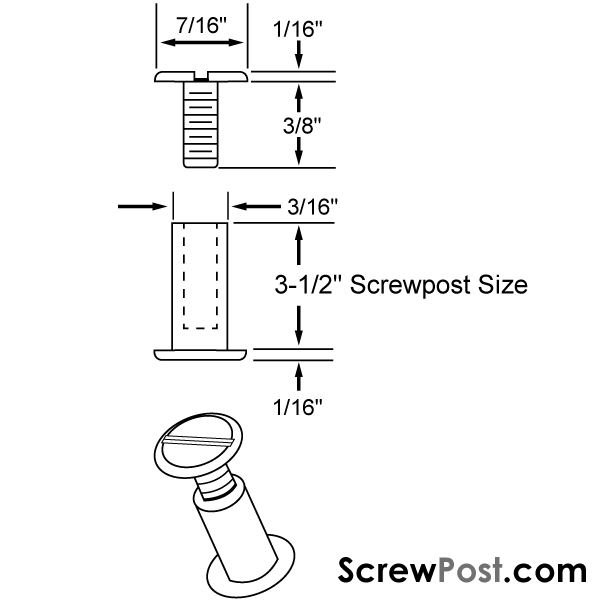 The overall length of a post with the screw installed is approximately 3-5/8". If you would like to have a different appearance, try our plastic screw posts.